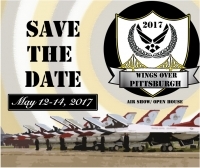 The 911th Air Lift Wing is excited to announce the 2017 Wings Over Pittsburgh Air Show to be held May 13-14 of 2017. But before we can see the Thunderbirds soar through our sky, they need some help from you. What would you like the air show theme to be? Visit the 911th Air Lift Wing's Facebook Page and Click your favorite theme and hit like to cast your vote, and if you have your own idea enter it in the "What would you like to see here?" graphic.The theme with the most likes by the end of June will be chosen as the theme for Wings Over Pittsburgh 2017. Click here for more information about Wings Over Pittsburgh 2017 featuring the Thunderbirds!